Josh Noem tried rustic retreats in the woods. He tried combining workouts and prayer. He even tried holding discussions at the local pub. But much to his chagrin, nothing worked. When Mr. Noem was hired as a campus minster at the University of Portland in 2005, he was asked to involve a larger number of young men on campus, but his programs failed to engage more than a handful of students, and many of those who did show up were already regulars. All that changed in 2007 when Mr. Noem and Thomas Bruketta, then a part-time campus minister at the university, came across an article called “Men, Spirituality, and the Collegiate Experience” by W. Merle Longwood, Mark W. Muesse, and William Schipper, O.S.B., that detailed the origins of a successful men’s discussion group at St. John’s University in Collegeville, Minn. Mr. Noem and Mr. Bruketta adapted the plan for their own students. They gathered 11 freshmen recommended by hall directors or professors and pitched the following: A small group would meet regularly for the next four years; each year, the men would discuss a different theme, keeping in mind the concepts of truth, brotherhood, justice and authentic masculinity. The freshmen were intrigued. They called themselves the League of Extraordinary Gentlemen, in a playful homage to the comic book series. 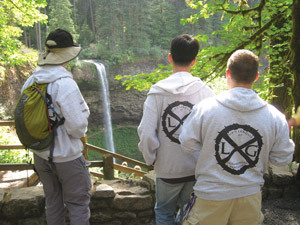 The group at Portland, which goes by the nickname LXG, has since grown to include more than 70 young men engaged in nine small groups at the college. For many, LXG was their first contact with campus ministry. Here is how it works: In the first year the men meet regularly—usually every week or every other week—to answer the question, “Who am I, and what do I believe?” In the second year, they discuss relationships. Year three covers resiliency, which Mr. Noem describes as a “code word for suffering.” In the final year they discuss their vocations. The discussions are facilitated by two members of the college faculty or staff, including laypeople and religious. The members also help to organize service opportunities and campuswide events that reach out to other men. Mr. Noem estimates a 75-percent retention rate overall since 2007. The purpose of the discussion groups, Mr. Noem said, is to provide a safe, confidential environment in which the participants can build core relationships and talk about those things that are “deeper and more authentic” than the stereotypically male topics of sports or women or video games. Spirituality may play a role in these discussions but it is not necessarily the focus, and students of all faiths or no faith are welcome. Mr. Noem said that listening to other men describe their beliefs enables participants to open up to one another in new ways. Last November, LXG was named an “exemplary program” for “facilitating personal development” by the Catholic Campus Ministry Association, meaning that the program offers a successful model that can be imitated by other colleges. Gar Kellom, a researcher who served as the executive director of the Men’s Center at St. John’s University in Collegeville, Minn., for nearly two decades, was one of the founders of the student discussion groups on which LXG was based. In 2008 he obtained a grant from the Lilly Endowment and awarded funds to 14 U.S. colleges to help them identify the best practices for increasing male engagement in vocational discernment activities. Some institutions, like the University of Portland and Siena College used some the funds to assist with men’s discussion groups, while others sought to motivate male athletes to spend time volunteering or to train faculty members for new courses or to conduct research. Sometimes, however, the stereotype comes in handy. One of LXG’s yearly events is called the Manquisition, a kind of mock trial involving cartoonishly macho judges who demand explanations from those men who do not conform to similarly macho stereotypes. The list of defendants at the event (the tone of which is described by Caldwell as “Stephen Colbert meets Monty Python”) has included a priest, a male student majoring in education, a student engaged to be married and a senior who made a quilt for his girlfriend for Christmas. Amid the humor, “defendants” offer moving testaments to their atypical choices and lifestyles. Browse additional resources for male ministry. Great piece, Kerry. I do hope the concept catches fire all over collegeland or where the boys are! The world would be better off for all of us for sure. Thank you. Everyone who works with young people needs to read this article. It's the most hopeful thing I've read in ages. Great work!!! Excellent article about an interesting program! We could all learn from this concept, whether we are young or old, male or female. Thank you. Very interesting. Bear and chainsaw approach produces results. Who woulda thunk? This article also appeared in print, under the headline "A Guy Thing," in the July 4, 2011 issue. Kerry Weber is an associate editor of America.